The common cliché on Wall Street is that the four most dangerous words in investing are, "This time is different." But I've found a three-word phrase that's uttered just as frequently... and is arguably even more dangerous. You've probably grumbled these words before. Especially if you've ever passed on a stock you were considering buying... then watched as it marched to new high after new high. The thing is, a great run higher doesn't necessarily mean it's too late to buy. In my decades as a value investor, I've seen it time and time again. Value investors like me tend to look in the bargain bin for beaten-up stocks that are trading at 52-week (if not multiyear) lows. They get a sense of satisfaction from getting a better deal than the guy who bought it a month or a year ago. But what about stocks that never really fall out of favor and end up in the bargain bin? We value investors often miss them. 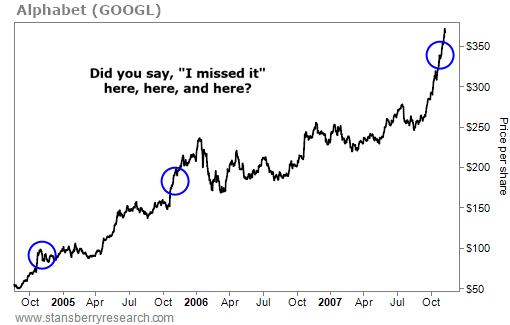 Take Alphabet (GOOGL). In August 2004, the company went public at a split-adjusted $42.50 a share. By October, the price had already more than doubled. A year after that, it had doubled again. And two years after that – in October 2007 – shares were trading at $355. Today, they're up to around $1,200. Sure, it would be great to have bought as soon as it went public. You'd be sitting on gains of more than 2,800% today. But even if you didn't buy on day one, you didn't miss it. It would be one thing if I had done the work on it and concluded that it was outside my circle of competence (it wasn't) or was too expensive (it wasn't). But that wasn't the case. I simply didn't do the work. Why? It's not because I was lazy. Rather, every time I looked at the stock, it was usually trading at or near an all-time high, so I kept telling myself, "I missed it" and moved on. If I had just bought what I knew was a great business at any of those points, I'd be sitting on a multi-bagger today. Let me give you another example. My friend Chris Stavrou, who runs Stavrou Partners – a family office based out of New York – bought shares of Warren Buffett's Berkshire Hathaway (BRK-A), back when he was a stockbroker in the 1970s. He started buying it for his clients around $400 a share – after it had risen more than 2,000% over the previous decade. But Chris didn't fall into the "I missed it" trap. A decade later, he opened up his own hedge fund. By then, Berkshire was trading at an all-time high of $1,800 a share. So did he say to himself, "Wow, this stock has moved up a lot – I think I'll wait for a pullback" or "Drat, I missed it"? No. He saw that it was a great company run by a brilliant investor and the stock was still attractive at $1,800. So he bought it for his nascent fund – and still owns those shares today, each valued at more than $300,000! So learn this lesson well: Whether a stock is trading at a 10-year low or a 10-year high tells you absolutely nothing about whether it's cheap or expensive. Some stocks trading at multiyear lows are horrible value traps that are headed to zero. And some stocks trading at multiyear highs are going to be spectacular winners going forward. The lesson here is, don't fall into the "I missed it" trap. Ignore where the stock price has been, do the work, and make a rational decision based on your assessment of where the stock is likely to go in the future. Editor's note: Whitney knows all about spectacular winners. He bought Apple at $1.50 and Amazon at $56... and he's nailed so many big market calls that CNBC dubbed him "The Prophet." Now, the man who predicted the dot-com crash, the housing bust, and more is holding a free online event tomorrow night... And what he reveals may be his biggest prediction yet. Save your spot right here. "The next time a hated stock or industry catches your eye, tune out all the negative headlines and analyst 'sell' recommendations, keep an open mind, and take a fresh look," Whitney writes. Read more about an experience he had with a surprising investment that led to big gains right here. "While the rest of the investment crowd is busy looking for the next way to get rich quick, I strongly suggest taking a different route," Whitney says. Learn more about his contrarian strategy here: The 'Cocktail-Party Indicator' Can Save (or Make) You a Fortune. 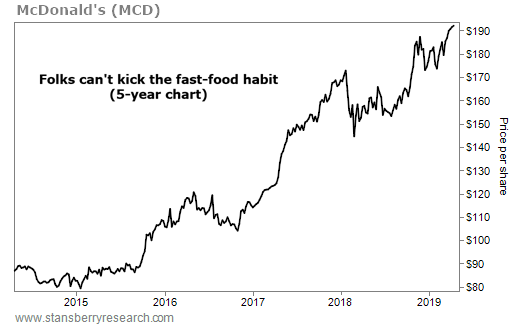 McDonald’s (MCD) is a $145 billion fast-food powerhouse. It boasts about 14,000 U.S. locations, plus 23,000 restaurants in more than 100 other countries. Folks everywhere are hooked on its burgers and fries… And lately, demand is shooting even higher. The company says visits to its restaurants have gone up for two years straight – a streak that hasn’t happened since 2012. Meanwhile, profits jumped 14% last year, reaching nearly $6 billion.